St. Ignatius Brianchaninov: Speak will of those who speak evil of you. . . . Speak well of those who speak evil of you. Pray for those who cause you various offenses, wrongs, temptations, persecutions. Whatever you do, on no account condemn anyone; do not even try to judge whether a person is good or bad, but keep your eyes on that one evil person for whom you must give an account before God–yourself. This entry was posted in Sayings from Saints, Elders, and Fathers, St. Ignatius Brianchaninov and tagged Evil for Evil, Good and Evil, Judgement, Judgement of God, Living Orthodoxy, Love of Others, Loving Neighbor, Offense, Persecution, Prayer, Temptation on September 30, 2015 by ocqadmin. 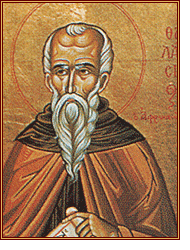 St. Neilos the Ascetic: . . .Rivalry over material possessions has made us forget . . . So we no longer pursue plainness and simplicity of life. We no longer value stillness, which helps to free us from past defilement, but prefer a whole host of things which distract us uselessly from our true goal. Rivalry over material possessions has made us forget the counsel of the Lord, who urged us to take no thought for earthly things, but to seek only the kingdom of heaven (cf. Matt. 6:33). Deliberately doing the opposite, we have disregarded the Lord’s commandment, trusting in ourselves and not in His protection. For He says: ‘Behold the fowls of the air: for they do not sow or reap or gather into barns; yet your heavenly Father feeds them’ (Matt. 6:26); and again: ‘Consider the lilies of the field, how they grow; they do not toil or spin’ (Matt. 6:28). When He sent the apostles out to declare the good news to their fellow men. He even forbade them to carry wallet, purse or staff, and told them to be content with His promise: ‘The workman is worthy of his food’ (Matt. 10:10). This promise is to be trusted far more than our own resources. Despite all this we go on accumulating as much land as we can, and we buy up flocks of sheep, fine oxen and fat donkeys – the sheep to supply us with wool, the oxen to plough and provide food for us and fodder for themselves and for the other animals, the donkeys to transport from foreign lands the goods and luxuries which our own country lacks. We also select the crafts which give the highest return, even though they absorb all our attention and leave no time for the remembrance of God. It is as if we accused God of being incapable of providing for us, or ourselves of being unable to fulfill the commitments of our calling. Even if we do not admit this. openly, our actions condemn us; for we show approval of the ways of worldly men by engaging in the same pursuits, and perhaps working at them even harder than they do. 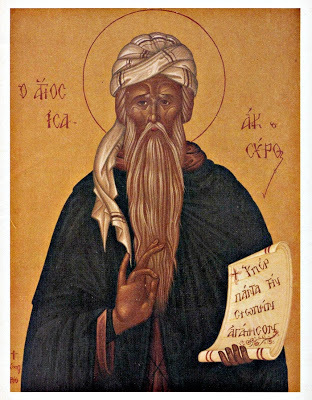 This entry was posted in Sayings from Saints, Elders, and Fathers, St. Neilos the Ascetic and tagged Apostles, Belief in God, Birds, Career, Do not sow or reap, Faith in God, Lack of Faith, Living in the World, Living Orthodoxy, Living Simply, Material World, Purpose of Life, Remembering God, Scripture Gospel of Matthew, Simplicity, Stillness, Worldliness on September 18, 2015 by . Elder Thaddeus: Abstinence is for everyone, not just for monks. Husbands and wives for whom marriage means only . . .
Abstinence is for everyone, not just for monks. Husbands and wives for whom marriage means only the satisfaction of bodily passions will not be justified. They will answer before God for not having been abstinent. Of course, as the Apostle says, they are not to abstain from each other for a long time, lest the devil deceive them, but they should abstain according to mutual consent (cf. I Cor. 7:1-6). Married people should abstain from corporeal relations during fasts and on great Feast days. This entry was posted in Elder Thaddeus, Sayings from Saints, Elders, and Fathers and tagged Abstinence, Asceticsm, Fasting, Feasts of the Church, Living Orthodoxy, Lust, Marital Relations, Marriage, Monasticism, Monks, Passions, Scripture Epistle 1 Corinthians on August 30, 2015 by . St. Ambrose of Optina: . . . you should care about the main thing . . . This entry was posted in Sayings from Saints, Elders, and Fathers, St. Ambrose of Optina and tagged Death, Living Orthodoxy, Quotes of the Optina Elders, Remembering Death, Short Quotes on August 23, 2015 by . St. Isaac the Syrian: A humble man is . . .
A humble man is never rash, hasty or perturbed, never has any hot and volatile thoughts, but at all times remains calm. Even if heaven were to fall and cleave to the earth, the humble man would not be dismayed. Not every quiet man is humble, but every humble man is quiet. There is no humble man who is not self-constrained; but you will find many who are self-constrained without being humble. This is also what the meek humble Lord meant when He said, ‘Learn of Me, for I am meek and humble of heart, and ye shall find rest unto your souls.’ [Matt 11:29] For the humble man is always at rest, because there is nothing which can agitate or shake his mind. Just as no one can frighten a mountain, so the mind of a humble man cannot be frightened. If it be permissible and not incongruous, I should say that the humble man is not of this world. For he is not troubled and altered by sorrows, nor amazed and enthused by joys, but all his gladness and his real rejoicing are in the things of his Master. 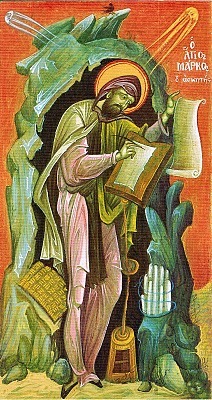 Humility is accompanied by modesty and self-collectedness: that is, chastity of the senses; a moderate voice; mean speech; self-belittlement; poor raiment; a gait that is not pompous; a gaze directed towards the earth; superabundant mercy; easily flowing tears; a solitary soul; a contrite heart; imperturbability to anger; undistributed senses; few possessions; moderation in every need; endurance; patience; fearlessness; manliness of heart born of a hatred of this temporal life; patient endurance of trials; deliberations that are ponderous, not light, extinction of thoughts; guarding of the mysteries of chastity; modesty, reverence; and above all, continually to be still and always to claim ignorance. This entry was posted in Sayings from Saints, Elders, and Fathers, St. Isaac the Syrian and tagged Chastity, Endurance, Forsaking the World, Humble, Humility, Joy, Living Orthodoxy, Meekness, Moderation, Modesty, Patience, Poverty, Scripture Gospel of Matthew, Sorrow, Stillness, Thoughts, Virtue on August 18, 2015 by ocqadmin. St. John the Wonderworker: . . . Receiving the Body of Christ, while turning away from Him in spirit, is like . . .
For a man’s complete sanctification, the body of the servant of the Lord must be united with the Body of Christ, and this is accomplished in the Mystery of Holy Communion. The true Body and the true Blood of Christ which we receive become part of the great Body of Christ. Of course, for union with Christ, the mere conjoining of our body with the Body of Christ does not suffice. The consumption of the Body of Christ becomes beneficial when in spirit we strive towards Him and unite ourselves with Him. Receiving the Body of Christ, while turning away from Him in spirit, is like the contact with Christ which they had who struck Him and mocked and crucified Him. Their contact with Him served not for their salvation and healing, but for their condemnation. But those who partake with piety, love and readiness to serve Him, closely unite themselves with Him and become instruments of His Divine will. This entry was posted in Sayings from Saints, Elders, and Fathers, St. John of Shanghai and San Francisco and tagged Crucifixion, Eucharist, God's Will, Incarnation, Living Orthodoxy, Spirit, The Church, Theosis on July 28, 2015 by . St. Sebastian Dabovich: We hear it frequently remarked that it matters not what one believes if he does right. But . . . This entry was posted in Sayings from Saints, Elders, and Fathers, St. Sebastian Dabovich and tagged Beauty, Curiosity, Delusion, Dogma, Heart, Heresy, Heretic, Idolatry, Infidelity, Living Orthodoxy, Logic/Logical Mind & Thinking, Morals, Orthodox Faith, Polygamy, Self Love, Spiritual Fruit on July 1, 2015 by .